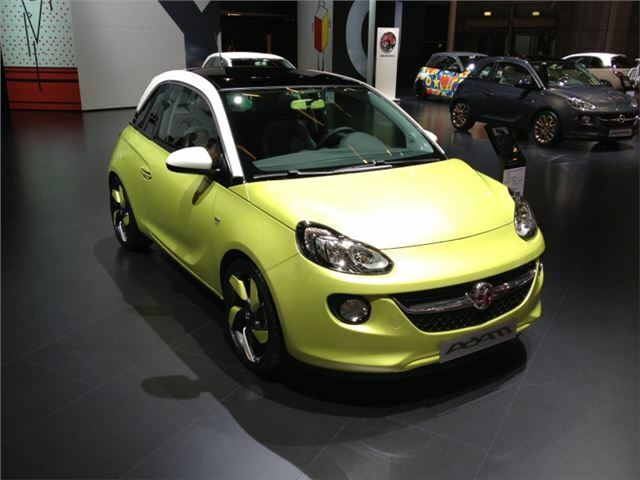 Vauxhall has officially unveiled its new small hatchback - called the Adam - at the Paris Motor Show. We're not quite sure where the odd name comes from but in terms of styling it seems Vauxhall has been influenced by plenty of other small yet stylish cars. It will be available to order in September with the first cars arriving in January 2013. Prices start at £11,255. The firm describes the Adam as 'heralding a sea-change in the fashion-led hatchback market' but in our opinion it looks like a mish mash of bits from the Citroen DS3, Audi A1, MINI and the Fiat 500. It's obvious the three-door Adam is aimed at buyers those cars so it's ironic that Vauxhall says the newcomer has a 'fresh and bold design' that they claim will appeal to 'open-minded individuals'. Whether those buyers will see a Vauxhall as desirable as an Audi or a MINI for example, remains to be seen. Personalisation is a big thing with the new Adam with a large variety of customisation options including two different roof colours (similar to all its rivals), various interior colours, headlining and a LED-lit roof trim. There are three trim levels - Jam, designed to be fashionable and colourful, Glam which is supposedly elegant and sophisticated plus Slam, a sporty trim. Power comes from a choice of three petrol engines, all of which are four-cylinder units. The entry-level is a 1,2-litre with 70PS plus there are two 1.4-litre engines, one with 87PS and the top 100PS version. All comes with a five-speed manual gearbox while a stop/start system is available as an option. After launch there will be a new small petrol added which has direct injection and a turbocharger plus an all-new six-speed gearbox. As well as Bluetooth the Adam is available with an infotainment system which is designed to connect with iPhones and Android-based smartphones and has a seven-inch colour touchscreen. The Adam is also available with a heated steering wheel.Other new-to-Vauxhall technology includes an Advanced Park Assist system which measures parallel spaces and then automatically steers the car in while the driver controls the brakes and accelerator. Wheel sizes range from 16-inch to 18-inch and cars that are specified with 17-inch or 18-inch wheels come as with the lowered sports chassis. The latest generation ESP system is standard including a Hill Start Assist function. Handling on city roads is helped by a CITY mode, which increases the electronic power steering system’s assistance at lower speeds. Prices for Adam Jam start at £11,255, moving up to £12,650 for Adam Glam and £13,150 for Adam Slam. Named by Opel after the founder, 'ADAM' Opel. Wakey, wakey!!!!!!!! Adam Opel was the founder of the Opel Automobile Company in Germany. That might have something to do with the name.